Comments and discussion about the role of Jewish visual arts in Jewish civilization. 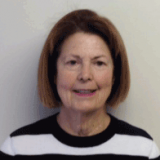 Review by Jenni L. Schlossman, Ph.D. This traveling exhibition is especially relevant because of the current political climate, where sitting at home and saying nothing about the injustices toward marginalized people in the US can be seen as being complicit in these actions. 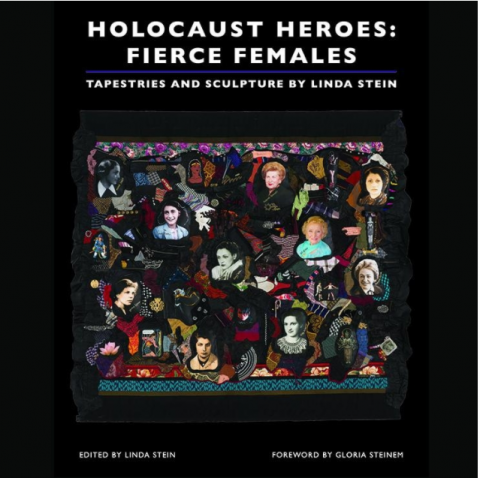 Stein’s tapestries highlight ten Jewish and non-Jewish “Fierce Females" referencing them as "brave upstanders" declaring a distinct contrast to "bystanders" who stand by idly and do nothing "against bullying and bigotry, … persecution, sexual abuse, and harassment.” (16) Stein’s powerful tapestries are collaged images and texts about Anne Frank, Ruth Gruber, Vitka Kempner, Noor Inayat Khan, Zivia Lubetkin, Gertrud Luckner, Nadezhda Popova, Hadassah Bimko Rosensaft, Hannah Senesh, and Nancy Wake. These women contributed significantly during WWII, but other mostly male narratives have eclipsed their stories, and they need to be remembered as strong women who were not willing to be victims. Stein’s works of art bring up discussions of the "other" in our society, in order to help find solutions and actions to solve problems, and in this way, she becomes a "Brave Upstander" herself. In the essay, “Forgotten Female Holocaust Heroes,” Eva Fogelman discusses how both men and women participated in WWII, but that it was the men who were honored for their bravery and sacrifice, while most women who participated weren't recognized. She discusses why that is the history we learn, and theorizes why the names of Jewish women in the resistance, except for a few, are forgotten. In the exhibition, a viewer can scan the large-scale tapestries and then focus on one at a time, while being surrounded by the auras of these brave women. In the catalogue, each hero’s story is told in an essay along with images of the tapestries. Some are personal stories, while others also provide insight into the women through historical research. Overall, these ordinary women did extraordinary things, and Stein provides their narrative in the tapestries using photographs and texts, but also contrasts the historical with figures from popular culture, her favorite being Wonder Woman. Stein’s figurative narratives, supported by her background in abstract art, make the images especially powerful to a wide range of audiences, encouraging them to be “Upstanders” rather than bystanders in the fight to “never forget” the narratives of heroic Jewish and non-Jewish women. In the United States, Teacher Appreciation Week is in the spring. This year May 5-9 is Teacher Appreciation Week, with Tuesday May 6 being designated as National Teacher Day. It is a fitting time to remember Ephraim Keyser, 1850-1937, whose long tenure as a teacher in Baltimore at the Maryland Institute (now The Maryland Institute College of Art or MICA) and the Rinehart School of Sculpture affected the lives and careers of many students. In 1893 Keyser was hired to teach modeling in the Maryland Institute's day school. He also was an instructor in the Freehand Division of the night school. In October of 1900, a third teaching position was added, as Keyser became head of the Rinehart School of Sculpture, which was allied with the Maryland Institute and offered advanced instruction in sculpture. He remained head of the Rinehart School until 1923 but continued to give lectures there and in the day school of the Maryland Institute until shortly before his death. 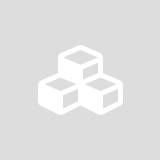 We can learn about Keyser as a teacher by looking at some of his correspondence that survives and by reading statements about him from his students and contemporaries. Keyser wanted his students to have the best possible opportunity to learn and tried to acquire proper aids for his classroom. Toward that end, he wrote to the chairman and trustees of the Rinehart Fund in a letter dated October 14, 1909, and asked for a skeleton. He notified them that, "a well articulated and mounted skeleton is a need greatly felt and it would add greatly to the efficiency of the class could one be obtained." The trustees apparently did not purchase the skeleton that year because on October 14, 1910, he again pleaded to the chairman and trustees for a skeleton. "My work in the class is greatly handicapped by the lack of a well articulated skeleton so necessary to teach the structure of the figure and I earnestly request that one be obtained." Keyser's concern for his students did not stop after they left his classroom. In 1907 one of his sculpture students was awarded a Rinehart scholarship to study in Paris. Keyser, concerned that the student, who had never been away from home, would have difficulty adjusting to life in Paris, promptly wrote to his nephew, Leo Stein, asking Leo to look after the student. Keyser was well regarded by his students as evidenced by the following quote from Isabelle Schultz Churchman in The Rinehart School 75th Anniversary Catalogue, 1896-1971, "Mr. Keyser considered anatomy as vital for both sculptors and painters and would give lectures on it to the whole Institute. The students would flock to hear him…His most popular lecture was the one on the face and head for he would demonstrate the facial expressions and even wiggle his ears, to the delight of all." A lighthearted comment found in the 1908 yearbook of the Maryland Institute demonstrates esteem for Keyser. The unnamed wag reported in the yearbook that, "With that left paw Keyser could draw." The September 17, 1924 Baltimore Sun reported on a dinner honoring Ephraim Keyser held at the Baltimore Museum of Art. During the dinner, J. Maxwell Miller, another Baltimore sculptor and teacher gave a testimonial of his esteem for Mr. Keyser as a teacher. According to Miller, a young student obtained from Keyser, more than guidance in art, but a philosophy of life. According to the February 21, 1937, Sun newspaper, a past student of Keyser's, Miss Valerie H. Walter, wanted to honor her late teacher and called a meeting of his former pupils to plan a memorial exhibit. The newspaper reported that Miss Walter had exhibited in New York, Rome, Paris, and London but had never found anything to equal the inspiration she derived from Ephraim Keyser. Keyser's students are deceased themselves now. It is well that some of their written praise of their former teacher survives to validate the career of this fine educator.